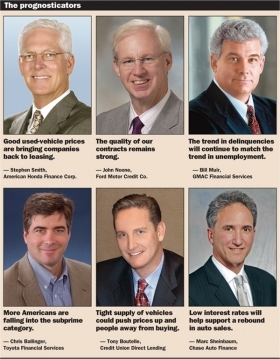 With leasing and the availability of credit still wild cards in the outlook for 2010 vehicle sales, Automotive News asked a roundtable of lenders how they see the market shaping up next year. -- Stephen Smith, senior vice president of American Honda Finance Corp.
-- John Noone, president of global marketing and sales at Ford Motor Credit Co.
-- Tony Boutelle, CEO of Credit Union Direct Lending. They were interviewed by Staff Reporters David Barkholz and Robert Sherefkin. Do you anticipate an increase in interest rates next year, and if so, why? How big will the increase be, and what impact will it have on vehicle sales? Sheinbaum: The Federal Reserve clearly has signaled its intent to keep interest rates low for the foreseeable future. Low interest rates will help support a rebound in auto sales. Ballinger: Futures markets are better at predicting interest rates than most forecasters, and most futures markets imply about 100 basis points increase in auto finance rates over the next year. With that modest increase, the positive impact of the recovery on sales should dwarf any small negative impact from higher rates. Noone: The Fed said last month it expects to keep rates in a target range of 0 to 0.25 percent and that economic conditions "are likely to warrant exceptionally low levels of the federal funds rate for an extended period." Boutelle: We see interest rates staying low through most of next year. We anticipate that will keep auto loan interest rates low. The overall economy won't be a deterrent to people going out and purchasing a vehicle. It's more about manufacturers having an availability of vehicles. We're seeing a pretty tight supply right now, and that could push prices up and push people away from wanting to buy. Delinquencies are increasing. Will this trend continue next year, and if so, why? Sheinbaum: Industry trends indicate delinquencies are stabilizing. If the economy continues to stabilize and improve, delinquency rates should improve next year. Ballinger: While there are encouraging signs of the economy stabilizing, significant risks remain, including rising unemployment and stressed consumers. So, unfortunately, we expect the industry will continue to see some increase in delinquencies in the immediate future. Smith: We've been very fortunate to see stability in our delinquencies and, in fact, even improvement. We've worked very hard to bring our credit losses in line to improve our overall performance. Muir: The trend in delinquencies will continue to match the trend in unemployment. Since we expect unemployment to remain high, we anticipate delinquencies will also be elevated above traditional levels. This trend should begin to improve toward the end of next year. Noone: The quality of Ford Credit's contracts remains strong, and our performance continues to be within expectations. In our business centers, we have the technology and processes to help customers stay in their vehicles. Boutelle: From the credit union perspective, we're seeing that delinquencies have leveled off and actually have gone down somewhat. The credit unions are doing a better job of managing risk, partially due to tools they are using to monitor their portfolios. After many lenders withdrew from or reduced auto leasing in 2008, some are dipping their toes back in but have not returned full force to leasing. What will happen to vehicle leasing next year? Smith: There were many factors that caused lenders to leave the lease business last year. When used-vehicle prices are strong, banks and finance companies will get aggressive on leasing; and when used-vehicle prices are weak, they lose a lot of money and leave the business. With very good used-vehicle prices today, we're seeing that pattern continuing with companies re-entering the lease business. We want and need to be around in good times and bad ones. Many of our dealers have built successful leasing businesses with loyal customers returning year after year. It's very important for us to be consistent with our leasing strategy so we can stick it out during the tough times. Muir: We would expect leasing volumes to increase somewhat next year but not to the levels seen prior to 2008. The extent to which leasing volumes increase will be a function of how much subvention dollars the OEMs are willing to invest. Noone: Unlike others, Ford Credit never left leasing. Ford Credit has continued to offer leasing on all models throughout this economic downturn. Our retail and leasing mix has always varied based on market conditions. Ballinger: Unlike many others, Toyota Financial Services remained committed to vehicle leasing even through the worst of the current economic challenges and fluctuating used-vehicle values. Not only did we have significant demand for leasing, we have a class-leading remarketing department, which has helped strengthen already high residual values. Sheinbaum: Chase intends to continue its current approach of offering leasing only for the manufacturers we support: Subaru, Mazda, Jaguar and Land Rover. Which finance entity is best poised to succeed next year: credit unions, banks, captives or independent finance companies? Why? Boutelle: The low cost of funds that credit unions have been able to maintain maybe gives them a competitive advantage. They haven't been hard hit by delinquencies and haven't taken the government money that requires a fair amount [of interest] to carry. I think credit unions will be more aggressive in lending money. The alternative is to put it into a very low-yielding, less-than-1-percent-yielding investment instrument. Noone: Ford and Ford Credit believe -- and our dealers agree -- that Ford Credit is uniquely positioned to support vehicle sales. Ford Credit provides dealerships with dedicated support that can only be offered by a captive without competing interests or priorities. Smith: This past year we actually increased the number of dealers for whom we provide inventory financing and other dealer financial services. We hope that dealers will look to us as their first choice for a lender because we're firmly committed to their success. But I think there's room for everyone. We can't buy everything, and we don't intend to. Muir: The auto finance business isn't for the faint of heart and never has been. Companies that succeed in this business will have a mix of traits from all four types of companies: funding flexibility, a customer-centric approach, deep industry experience and a broad product offering. GMAC has the unique advantage of carrying all of those traits. Sheinbaum: It's not a question of one financial sector being better poised than another. Chase has managed credit, underwriting and customer relationships successfully through the recession. Then factor in our financial strength, and we're poised to take advantage of next year's opportunities. Ballinger: As the economy began its downhill slide, many banks and lenders pulled out of auto financing and leasing or severely cut back, leaving their dealers with fewer options and less support just when they needed it most. Already-strong captive finance companies that stood by their dealers throughout the worst of the downturn are now in a very good position to excel. We have a competitive advantage in both our cost of funds and our commitment to bringing customers back to the dealers. Will subprime business increase next year because of high unemployment levels, and if so, who will step up to finance them? Sheinbaum: We've seen a lot of companies discontinue subprime lending, and capital markets have made it difficult for finance firms to start a subprime program -- and have challenged even existing subprime lenders to continue in the sector. Chase has always recognized that subprime lending requires prudent, well-underwritten lending practices and clear and concise guidelines for dealers. Subprime and near-prime are fairly robust sectors, and there are lots of opportunities for lenders such as Chase that provide good products and service. Noone: Ford Credit is not a subprime lender, but we have a proprietary originations system that provides us with the industry's leading ability to assess risk from applicants. As a result, Ford Credit can buy a full spectrum of business in support of our dealers and Ford customers. Muir: We regularly evaluate the processes we use to assess risk and will continue to finance a broad spectrum of retail consumers. This is part of our commitment to helping our dealers be successful, and it differentiates us from many other financial services providers, particularly in the past year or so. Ballinger: Due to the economic downturn and continued high unemployment, more Americans are falling into the subprime category. We look at more than just a customer's FICO score in basing credit decisions. We expect to continue supporting Toyota customers and our dealers by purchasing a reasonable spread of credit risk, just as we have always done. Boutelle: I'm not sure there's a strong appetite among credit unions for subprime loans. State and federal regulators have been focused on having credit unions operate with much less risk than in the past. Smith: We're not in the subprime business, and our customers don't fit that profile.